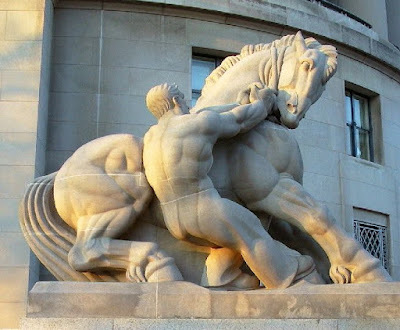 Outside the Department of Commerce building in DC are two statues of giant draft horses with muscular men restraining them bearing the title "Man Controlling Trade." It's a great metaphor but the wrong object. The drafts horses should represent the state, not trade, because the best government is that which governs least. Anarchy is a highly destructive evil....The stories in Judges 18-25 include some of the most horrible sins recorded anywhere in the Bible. These passages teach us the dreadful results of anarchy, a situation when there is no effective government at all.... This tragic narrative in Judges shows in gruesome detail why civil government is so badly needed among sinful human beings. Yes, the consensus opinion of theologians agrees with Grudem. What they all fail to notice is that God designed that “highly destructive anarchy.” And God was very angry with the Israelis for wanting to end such a "horrible" period in their history as he made clear in I Samuel 8. And while Judges records some awful sins, Israelis under the "destructive evil of anarchy" never sank so low as to commit child sacrifice as they did regularly under the kings. Here Grudem unwittingly teaches the dangers of listening to consensus. Yes, most theologians agree with Grudem; they just don't agree with the Bible. What sin did the prophets under the kings, whose governance Grudem values so much, charge against those governments? It was that the nobility bribed judges and corrupted the courts in order to steal the wealth of the less powerful, just as God told them they would. That never happened in the 450 years of the reign of the judges in Israel. They [rulers] give "approval" or praise...to those who do what is good (v. 3). In addition, the ruler "is God's servant for your good." These verses indicate that government has a role in promoting the common good of a society. It should not only punish wrongdoing but also encourage and reward good conduct, conduct that contributes to the good of society. As socialist judges have taken the "general welfare" clause of the Constitution to undo all of the restrictions on the state in the rest of the document, so conservatives take the idea that the state should do good to eliminate most limitations on the state, especially those of the Constitution. Like socialists, conservatives want a powerful state; they just want it to do different things with it. However, the concept of the "common good" is a pagan idea carried over from philosophers of Rome and Greece who defined the ultimate good as that which the patriarchs determined was good for the city. Any criminal act could be rationalized if the leadership said it was good. 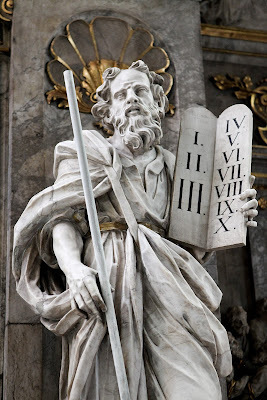 The Christian concept of the common good is keeping God's commands as summarized in the Ten Commandments. In the pagan version of the common good, corrupt politicians define it; in the Biblical version God defines it. In other words, the state has the authority from God to punish people who break God’s laws and nothing more; that is the “good” that God allows the state to do. Two of the more commonly used principles of hermeneutics favor O’Donald’s interpretation: 1) Let scripture interpret scripture and 2) consider the context, especially that of the God-designed government of Israel in the Torah. Finally, the Greek word for authority in Romans 13, exousia, means delegated authority; the state gets its authority from God and is limited by it. The other part of the truth is to say that governments have an immense influence on the conduct of people in a society.... In part, the influence of government comes by personal example.... Another reason that government influences conduct is that laws have a teaching function. ...every incremental increase in governmental regulation of life is also an incremental removal of some measure of human liberty. When small losses of liberty occur again and again over a period of years people can become essentially slaves to a government without ever realizing what is happening. And that is how conservatives have compromised with socialists to transformed the US into a socialist system over the past century. Grudem and other neo-conservative Christians need to read the political philosophies of the writers of the US Constitution and grasp the reasons they placed chains on the power of the state that Grudem and most conservatives consider too severe. And he needs to read Bootleggers & Baptists: How Economic Forces and Moral Persuasion Interact to Shape Regulatory Politics to get an idea of why we can never trust politicians to do the good that conservatives want to them to do. The Bible’s most important contribution is its view of human nature, that it has a tendency toward evil. Under the standard assumptions that dominated analysis before the public choice revolution, politics is modeled as the activity of a benevolently despotic and monolithic authority that seeks always and everywhere to promote 'the public interest,' which is presumed to exist independent of revealed evaluations and which is amenable to discovery or revelation. If this romantic image of politics is discarded and replaced by the empirical reality of politics, any increase in the relative size of the politicized sector of an economy must carry with it an increase in the potential for exploitation. The well-being of citizens becomes vulnerable to the activities of politics, as described by the behavior of other citizens as members of majoritarian coalitions, as elected politicians, and as appointed bureaucrats. In other words, conservatives are just being gullible if they think that all they need to do is to get the right man or woman in office and nothing bad will happen. J.M. Keynes promoted that nonsense when he responded to Hayek’s book, The Road to Serfdom, by saying the evil that Hayek predicted would never happen if the right sort of people were in power, people like him and Hayek. What Keynesian conservatives refuse to see is that even good intentions can have disastrous unforeseen consequences. As Mises wrote concerning regulations, you can’t eat just one; every new regulation distorts the economy in ways that require multiple additional regulations to fix the unforeseen consequences of the earlier ones. Christian Keynesian conservatives assume that Christian politicians don’t ever lie about their motives or even know their own motives. But the enormous power that American voters have given politicians is too much for even saints to bear. Have you ever known a politician who claimed to be Christian and governed the opposite of what he campaigned for? The state is a docile plow horse when severely harnessed. Unharnessed, even to do the “good” that neo-conservatives want, the state transforms into a destructive Leviathan.